If you’re headed here during the upcoming holidays and you want to explore the golf courses in the surrounding area, we can make some recommendations. First off, there are plenty of North Myrtle Beach golf course reviews online where you can read about other people’s experiences on the different courses. Check out the Customer Reviews page on our site. That’s often a good way to decide where you do and don’t want to play. There are so many North Myrtle Beach golf courses that it shouldn’t be too difficult to find one that exactly matches your skill level. But have you considered upping your game a bit by challenging yourself? You can play one of the easier courses when you first get here to, shall we say, get your feet under you. 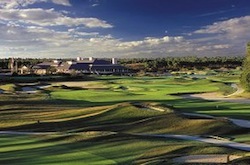 But then why not check out the Barefoot Landing golf courses, for instance. The Grand Strand region as a whole has over 110 championship golf courses, many of which were designed by the pros. Plenty of those golf courses are in the vicinity of North Myrtle Beach. Lucky for you there’s a ton of entertainment venues and restaurants you won’t want to miss out on in this area as well! You can find some of the best deals on golf and accommodations in the entire coastal South Carolina area when you start right here with our Myrtle Beach Golf website. Check out our Hot Golf Deals page and see where you can play and save a bundle! This entry was posted in North Myrtle Beach golf courses and tagged North Myrtle Beach golf courses. Bookmark the permalink.